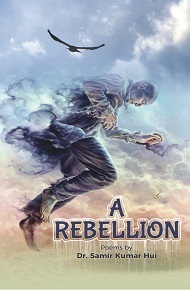 Dr. Samir Kumar Hui's anthology, A Rebellion, shows how the peopleexploited should organise themselves into a vital force to be reckoned to fight against injustice meted out to them in various establishments. The poet employs a distinctive style of his own in depicting vividly the situations he dwells at length on. His imagination soars to rare heights while composing poemsfor social change. He is at his best in dealing with the themes of his choice. The anthology deserves appreciation and applause by global poets. Dr. Huipublished his maiden anthology of poemsAn Odyssey. It received acclaim widely. His poems were published in national and international anthologies. His articles were published in international journal New Frontier, June 18, Annual issue No-4 ,Socio-economic Life in Odisha,2015 and AJC volumeVI,2013 and volume VII,2014 etc.His poetrycan be accessed at //Samirhui.2009@gmail.com//& at his blogspot//samirhuiblogspot.com//.He has miles to go in life spreading fragrance of his creative acumen.